Submitted Photo | Duck Radio manager and LCCC faculty member Bernie Kimpal died suddenly on March 19.
the last people he talked to, talking to him over the phone just three days before his sudden passing. We went over lesson plans for his classes and updates about Duck Radio. When I picked up the phone at 10:30 a. m. Thursday morning (3/16), he said “Hey, it’s me. I thought you’d be out getting food.” We laughed and I’ll never forget that. I actually first crossed paths with Bernie in June-July of 2004, when I was in a five-week internship with AM .930 WEOL. With WEOL being in the same building as 107.3 The Wave at the time, I often saw Bernie in his trademark suspenders and tie, rushing through the hallway, off to do some sort of work. Even though we never really talked then, when my internship was over members of both stations signed a goodbye card for me. Bernie signed the card, “Be Smooth – B Looking back.” That always made me smile. In 2009, I graduated from Bowling Green State University with my Bachelor’s Degree in Communications. I really wanted to come back and work for Duck Radio- the place where I first made my name and still remain today. 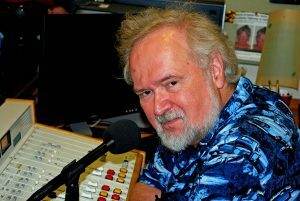 Bernie transitioned over to LCCC’s Duck Radio in 2007 and knew that someone was doing Duck Radio’s promotional work, but didn’t officially meet who until January of 2009. I worked for the man for two years and we never met. When it was discussed that I officially go on the Duck Radio payroll, he had no problem making that happen, because he saw that I gave amazing effort and did great work. Bernie had extraordinary character and compassion. In January of 2010, the transportation I used to get to and from work every day was cut and I sat home for ten months looking for transportation that would properly transport me and my power wheelchair. During this time, Bernie allowed me to continue to work from home and turn in my timecard. I was so grateful to him for this. He could have decided to let me go because I was only on campus 21 times in ten months. I felt so bad because I wasn’t there.But he stuck by me and knew I was working hard to get back to Duck Radio as soon as I could. To this day I haven’t taken a sick day since Thanksgiving, 2010. Bernie loved to tell stories but would hardly ever talk about his radio past to his students or Duck Radio staff. Bringing the best out in them with his expertise and knowledge, allowing each person’s skills shine through making them the best radio personality they can be. One of my favorite Bernie theories is- ‘Set your difficulty level for any task at a 1, so when you exceed your expectation, you’re not disappointed.’ He loved radio, his students and Duck Radio. He certainly taught me a lot and made a better person and radio personality. I just hope I will make you proud Bernie and won’t disappoint you. I will miss you, more than you know, and thank you for believing in me.